1. Can students living in Brandenburg apply to JFKS? 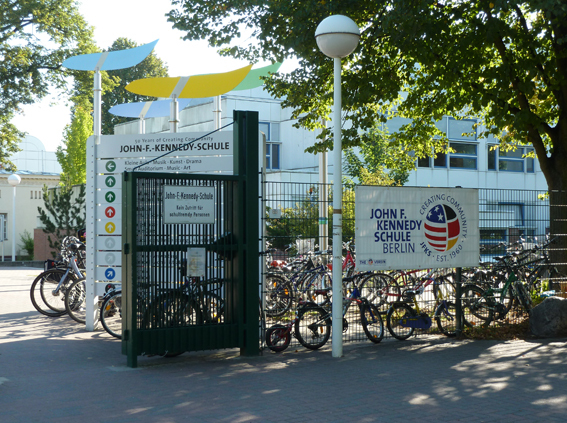 No, all new students at the John F. Kennedy School have to provide an official Berlin Anmeldebestätigung (official documentation of Berlin residency) at the time of admission. 2. Does JFKS charge tuition? No, the John F. Kennedy School is a public school and therefore does not charge tuition. 3. When is the deadline for students’ applications? 4. When will the admission decisions for the next school year be made, when will we receive confirmation about our child being admitted or not? The Entrance Class lottery takes place in April, afterwards official admissions letters will be sent out to Entrance Class parents. Admissions letters for High School students (grades 7-12) will be sent out by May, for the Elementary School (grades 1-6) by June. Please note that late admission is possible due to withdrawals or no-shows. Your application is valid and will be considered for late admission until December 31. 5. Is there a probation period for new students at JFKS? The probation period for students in the ES is one year, for students in the HS one semester. 6. Does JFKS offer an Open House to visit the school? There is no Open House but it is possible to schedule individual tours of the school. Please contact Annika von Maydell at gro.n1556274657ilreb1556274657skfj@1556274657emocl1556274657ew1556274657 to make an appointment. 7. Does JFKS have boarding facilities? The John F. Kennedy School does not have boarding facilities. 8. Which diplomas do students at JFKS work towards? 9. Do students applying to JFKS have to have prior knowledge of English and / or German? 10. Does JFKS offer accommodations for Special Needs students?